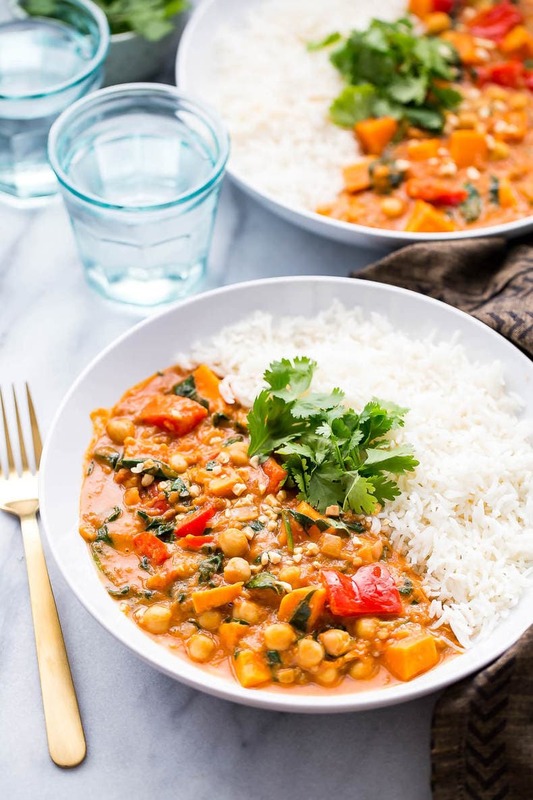 This Slow Cooker African-Inspired Peanut Stew is a hearty, savoury chickpea and sweet potato curry, served with basmati rice and topped with cilantro. It's also gluten-free and vegan! Let's say hello to my most favourite new dinner recipe – one that's perfect for the transition from winter to spring, and basically cooks all day while you're at work for one low-maintenance weeknight dinner! This new obsession of mine? 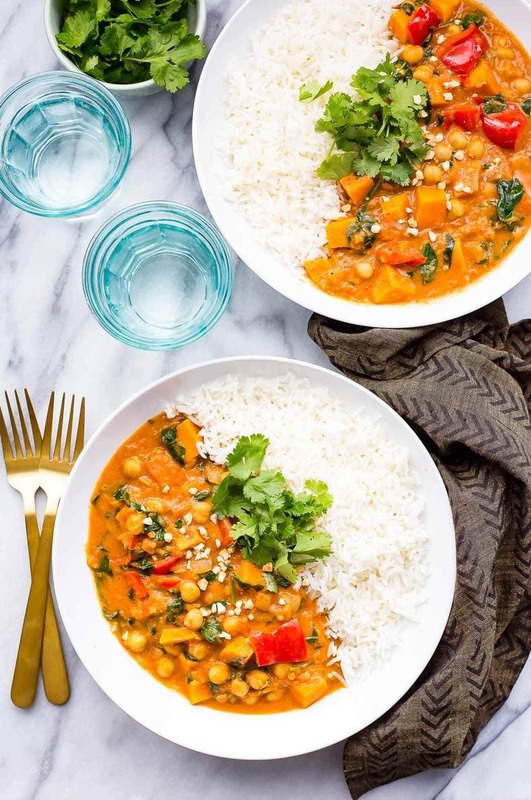 Slow Cooker African-Inspired Peanut Stew. I don't know about you but stew gets a bad rap in my household. Whenever my parents think of the word stew they automatically go to their parents' old school stew recipes with overcooked chunks of beef and little in the way of nutritional value save for some iron, and maybeeeee some vitamin A from the few carrots that were in there. Okay, so my grandmas weren't good cooks. I'm glad the bad cooking gene stopped with them. So even though this is technically a recipe for peanut stew, I guess stew is kind of bad word for it – it's mostly a curry. You can mop it up with some delicious naan bread, or serve it alongside basmati rice for a hearty, super-filling vegan meal. Or if you feel like you need a little bit of extra protein of course, you can always add in some diced chicken. I've definitely done that before. In fact, in the three weeks since I initially made and photographed this recipe, I've already made it again for my weekly lunch prep last week. It really is that good. It even got my mom's seal of approval after I convinced her that this was not in fact her interpretation of what stew is. 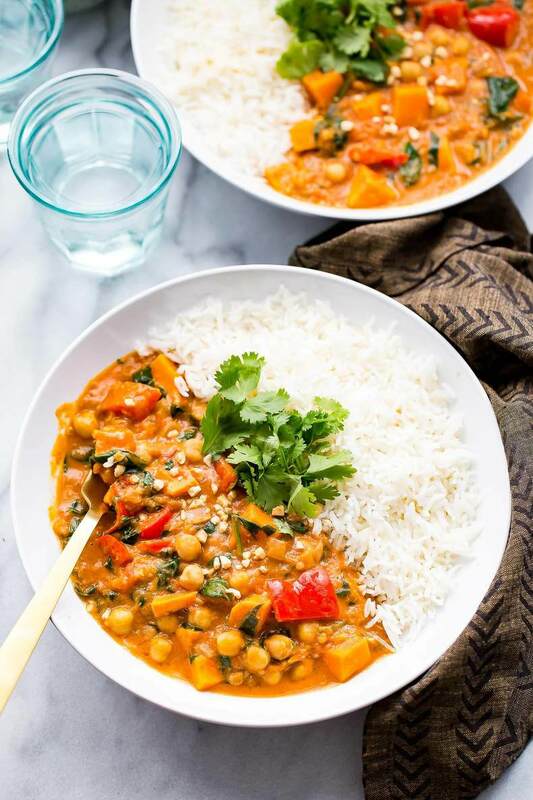 Aside from my own personal feelings about the flavours, this Slow Cooker African-Inspired Peanut Stew really is a one-pot wonder. 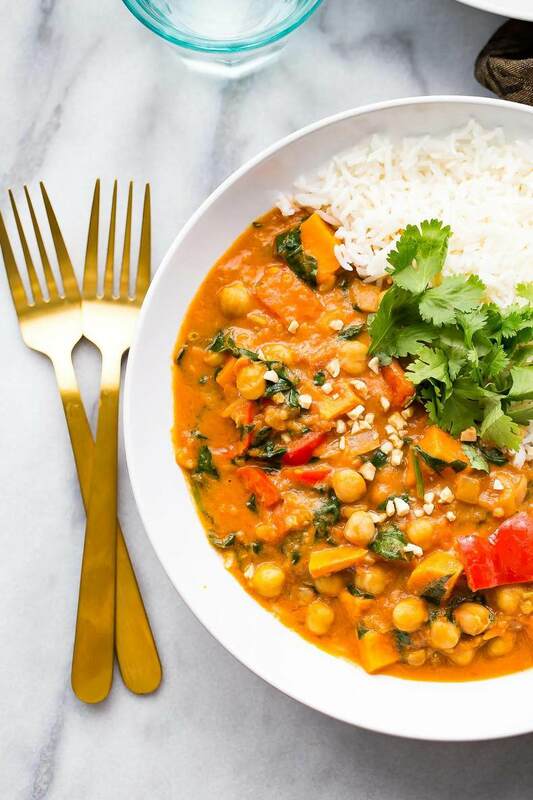 It's packed with veggies – sweet potato, onions, garlic, red pepper, spinach and cilantro – but what really makes it taste so unique is the curried, tomato sauce. Yes, it's got peanut butter! 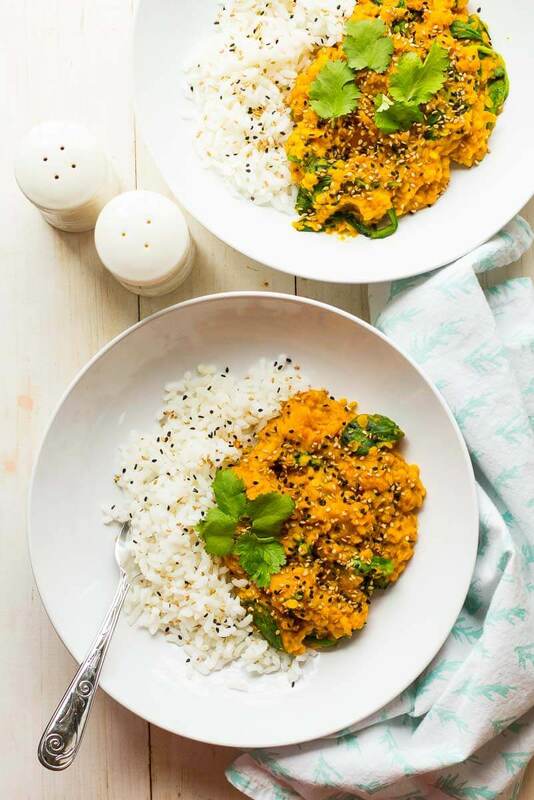 Peanut butter is my new favourite for curries – and not just those of the coconut milk variety. If you ever make a green curry from home, or even order one at a restaurant, you'll know that it's the spicest Thai curry on the menu. If you love the flavours but can't quite handle the spice, peanut butter is my secret weapon. It undercuts the spice in a way that doesn't dull the flavour, and it blends so beautifully to turn any curry into a creamy, savoury sauce. While I eat peanut butter almost everyday, it's usually in combination with some other kind of sweet thing, like on an English muffin or in a cookie, or with sliced apples. Well, peanut butter is also fantastic in savoury, salty recipes too, and if you're not a big fan of it with sweet things, you likely will be with a recipe like this because the flavour is so different. 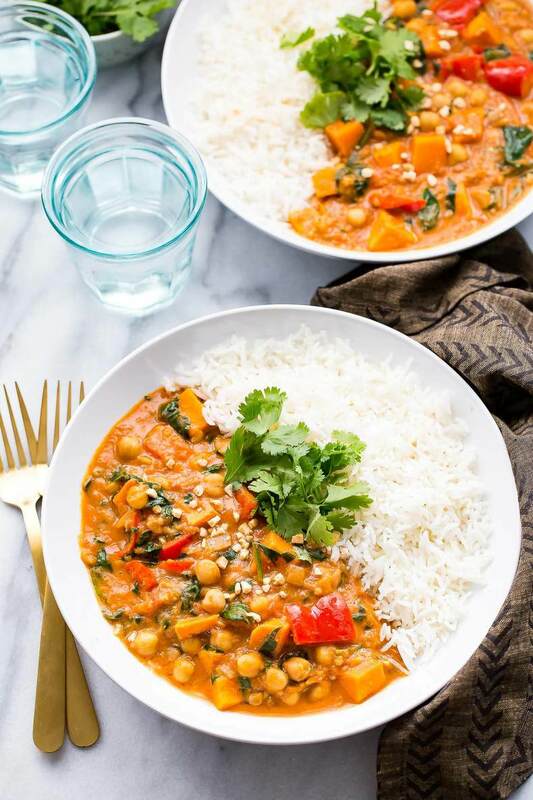 While traditional African-Inspired Peanut Stew recipes call for just sweet potatoes or a combo of sweet potato and chicken, I've added in some extra veggies like red peppers, spinach and cilantro to boost this recipe's nutritional value. That way, you don't have to cook or create anything else on the side. Who's got time for salad or side vegetables? My mantra for quick and easy weeknight meals? Just add in some extra veggies – whatever you've got on hand really will work. The key though is to stir the red peppers and spinach in near the end of the cooking time. So let's say you go to work and leave this cooking for the day. I would recommend adding the red pepper in maybe 20 minutes before you're about to serve it and then stir in the spinach and cilantro immediately before eating to ensure the veggies don't break down too much. Top these bowls with a little extra cilantro and some chopped peanuts for a crunchy garnish and voila, your next weeknight win. Or weekday lunch prep while you're out running Sunday errands or, you know, while you're out and about having fun on a weekend. 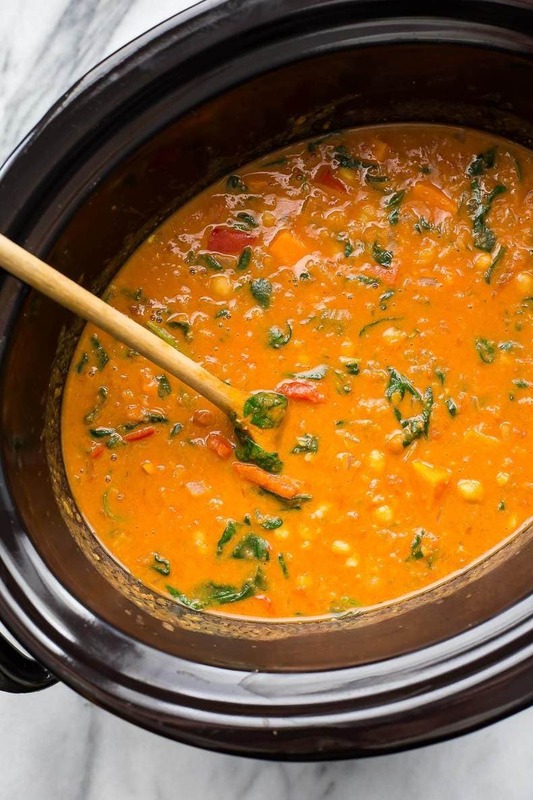 Will you be making this Slow Cooker African-Inspired Peanut Stew? I am seriously in love with this internationally-inspired recipe. You really can't go wrong with a cheap and easy weeknight dinner that cooks all day in the crock pot while you're at work. You don't have any excuse for why dinner isn't ready on time from now on! And as usual, if you try any of my recipes be sure to let me know on Instagram, Twitter, Facebook or in the comments – I’d love to see what you come up with!??? If you're looking for more slow cooker or one pot meals, I highly recommend you check out these other favourite slow cooker recipes of mine below! UPDATE: As of December 2017, this recipe has also been tested using the Instant Pot and on the stovetop. Both methods also work really well if you don't feel like using the slow cooker. 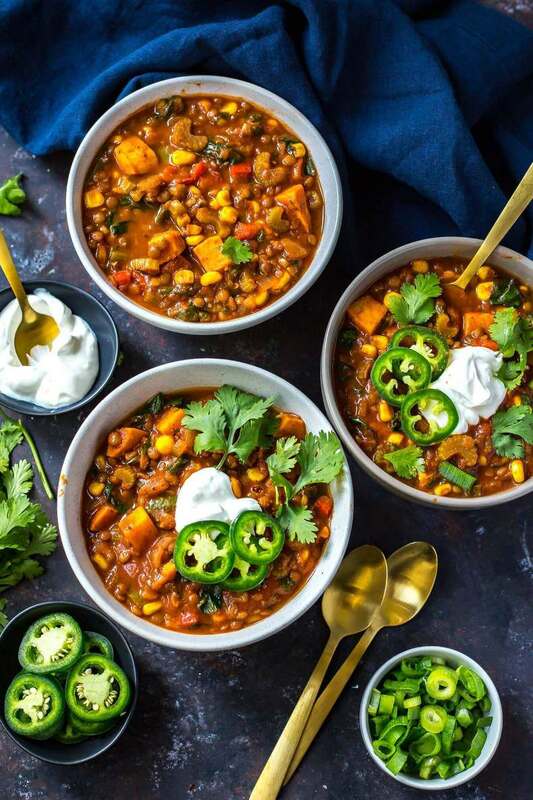 Read on for Instant Pot directions below! Get your Instant Pot here! Get your Slow Cooker here! I also love these glass meal prep bowls for reheating this peanut stew. Add all ingredients to slow cooker except for chickpeas, red pepper, spinach, cilantro, peanuts and rice. Cook on high for 6 hours, or low for 8 hours. Within the last half hour of cooking time, add chickpeas and red pepper. When ready to serve, stir in spinach and cilantro, reserving a bit of cilantro or serving more for garnish. Top each bowl with peanuts and serve with basmati rice. 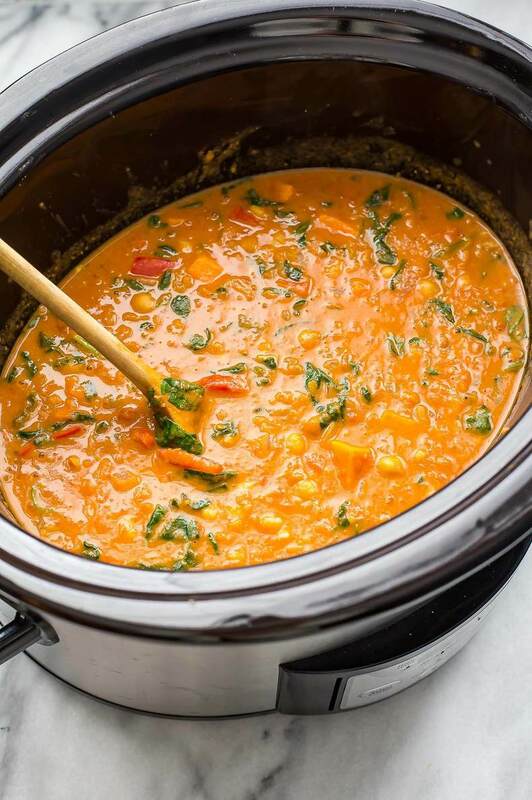 INSTANT POT INSTRUCTIONS: Dump everything into the Instant Pot in order that it appears listed above except for red pepper, spinach, cilantro, peanuts and rice. Cook on high pressure for 2 minutes and then do a quick release of the pressure. Remove lid, then stir in red pepper and spinach. Top each bowl with peanuts and serve with basmati rice. I saw curry and slow cooker and thought “this recipe is for me.” This looks delicious and so easy to make! Chickpeas and sweet potatoes are wonderful. I can’t wait to give this a try. This looks delicious! What kind of curry do you use? Also, have you ever tried using dried chickpeas and just leaving them in for a longer period of time? I made this for dinner yesterday and I am eating some for lunch right now. It is really delicious. I don’t find many recipes that I would make again, but I will definitely make this one again. Thanks for the recipe! When would you add the chicken if using? 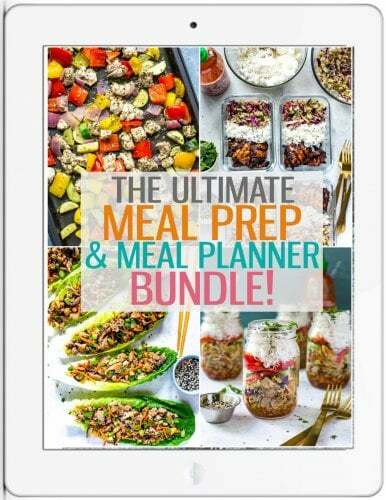 Hey Laura – add the chicken in at the beginning with the sweet potatoes and spices! made it today! enjoying it now!! mmmm so so good! Making this now, I had sunflower butter on hand so I used that, hoping it does not change the flavor to much. Super excited you try it! delicious! became a vegetarian just over a month ago and always looking for something new. this hit the spot! Hi Daniela! So sorry for the late response! My slow cooker is a 4 quart if I remember correctly but I’m sure you could make it in any size. The ingredients definitely won’t overflow! Has anyone cooked this in an Instant Pot (pressure — not the slow cooker function)? I’m new to it, and I’m not sure it’ll work. Thanks! Hey Nancy! Unfortunately I’m not sure what to recommend for the Instant Pot as this is a slow cooker recipe. 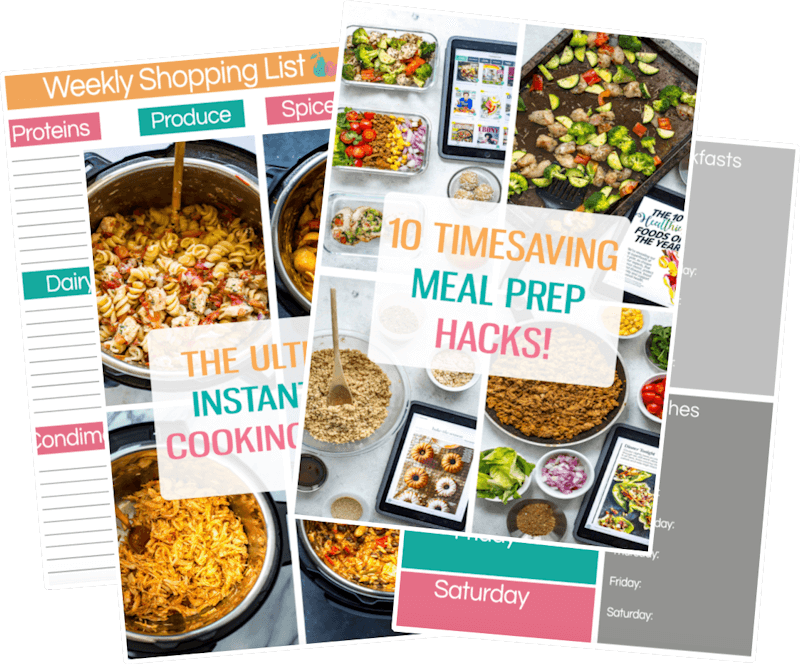 Although Instant Pot would be cool to try! Made this today and loved it! Altho I misread the directions and thought it was ready after 3 hours on high. It tasted good but the sweet potatoes and red pepper weren’t quite cooked enough. I’ll have a little more in a few more hours. 😆 Oh, also recommend doubling or even tripling the peanut butter! I love that peanut sauce taste. Hey Heidi! So happy it worked out for you – I should try adding more peanut butter, that’s a great idea!!! If you ever make the same mistake again with a slow cooker recipe you can always dump everything out into a large pot and bring to a boil then simmer for 10-15 minutes. That should do the trick with veggies not quite cooked through! Hi! I made this for dinner/my work lunches (I take soup each day in a mason jar) and it’s a wonderful gluten free meal (I’m a newly-diagnosed Celiac). I added grilled chicken to my dinner portion and I’ll just take along a 1/2c cottage cheese to eat with my lunch portions to boost my protein. I made it exactly as you wrote it with zero substitutions/changes other than dividing it into 8 portions (it filled up 8 mason jars perfectly, leaving a bit of room for the spinach on top). Thank you so much for this recipe- it’ll be added to my menu rotation! This was soooooo good! I changed the seasoning a tad for my taste and used some frozen collard greens as I didn’t have spinach, but all in all this was a HOME RUN! Do you think the left overs would freeze well to eat at a later date ??? If I wanted to do this on the stove top instead, any idea how long it should simmer for? I can’t wait to make this! Thank you for this recipe. My husband went Plant diet, and it’s the only reason I went stir crazy to find a family sit down meal the rest of us could enjoy. It’s delicious! My 4 year old and 1 year old could not get enough. It’s amazing how good this is. Looks, smells, and tastes amazing, and was so quick to make! So glad you liked it May! This is one of my favourites for sure! I made this last night as part of my meal prep for the week, & oh my goodness it’s delicious. I had to slap my husband away from it 🙂 …Will definitely be making this again. Oh now this looks yummy, I’m going to try it tonight! When you use chicken do you add raw or precooked and do you add it from the beginning or near the end? Hello, my sweet potatoes seem rather larger. Approximately how many cups should I have? IM making this right now, on the top stove because I came across the recipe a little late, and the smell of it is AMAZING! I’ve been trying the sauce to adjust the spice level and it’s so good! I can wait for it to finish and eat it with some rice! Thank you for a simple but great recipe!! What a dish!! Loved it. I’ve been on the toilet though for a couple hours… added some ghost peppers and got the ring of fire. This receipe is now cooking on slow-cooker and smells tasty. I was wondering about the nutrition facts. It says per serving, but how many grams is the nutrition facts detailing? This was absolutely fantastic! I made it in the IP on Slow cook mode and Oh My Goodness! Thank you for posting this recipe! This recipe is awesome. Vegetarian, easy, satisfying, packed with protein and very delicious. I use kale instead of spinach and a little less crushed tomato. I may even experiment with butternut squash and different beans. I’m using butternut squash cubes in mine….waiting for it to finish cooking! 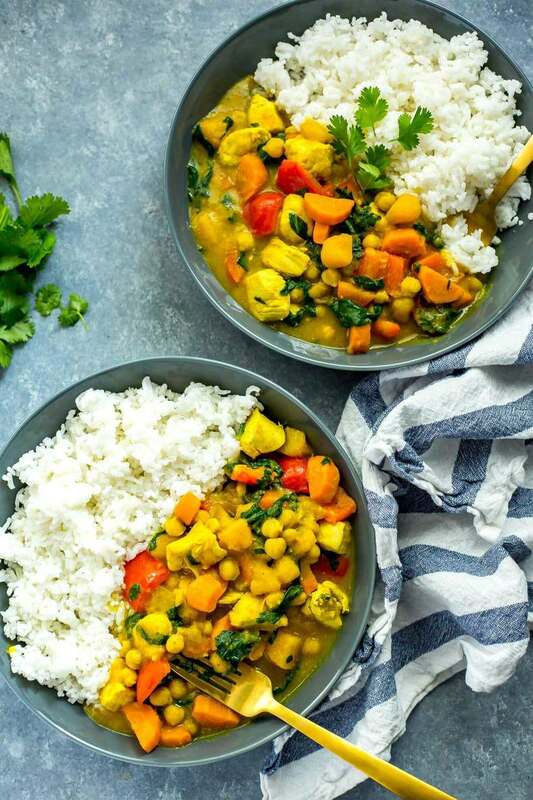 Your African peanut curry has become a family favorite – three thumbs up! I’m so happy to hear that Jean!!! 🙂 So glad you like it so much! Hi there! This recipe is awesome, and turned out great for me! I was wondering what serving size your nutrition facts are in? Thanks so much! Tried it today for the first time. Absolutely delicious! Is a keeper for my family! Thanks for sharing! The spinach and cilantro are added before serving. I plan to make this and have it for lunch all next week. should I wait to put the spinach and cilantro in after i reheat the stew? Question – Can you freeze this? So I want to try this, but my slow cooker doesn’t work – first time using it too. Any tips on cooking this without the slow cooker? Thanks! Hey Mike – you should be able to just dump everything in a pot on the stove, bring to a boil and then simmer for 20-30 minutes. Hope that helps! This recipe was amazing. I rarely go back to comment on recipes but it was that good! I used coconut oil and omitted chili for my son. He had two servings and wants leftovers again tonight. Well done! YAY!!! So happy to hear that April, thanks for sharing with me 🙂 This is definitely one of my old favourites that I return to make myself!!! This is sooo tasty! What would you consider a portion size? Yay glad you like it Keylee! You divide the recipe into six portions and one of them is a portion size. Sorry I can’t give cup measurements! I have slow-cooker-african-inspired-peanut-stew/ in the crockpot at home now – we’ll see! I looked over the site many times and could not find amounts anywhere – I am used to guessing so that is what I did… but did you have the amounts on there somewhere that I missed? Hi Ellen – the amounts are on the recipe. I’m sorry I’m not sure what you mean! This is one of my favourite recipes. Everyone who has tried it loves it. I’m so happy you like it Cindy! 🙂 Thanks for sharing!!! This recipe I see on our regular rotation. We just love it. Simple to make , filling, healthy and delicious! Thank you! What is the serving size? I know it says there are 6 servings, are they 1 cup servings? Hey Brittany – you would need to divide the recipe in 6 to get a serving size. Unfortunately I don’t provide measurement-based serving sizes but around 1 to 1.5 cups seems about right if I were to guess. I made the recipe with Acorn Squash because that’s what we had on hand. It turned out delicious. My husband thought it was great, too. Definitely a keeper. I love this recipe. I make it often and double it for lots of leftovers. Have a new instant pot so fig give it a try. I got the error message burn on it. Food was just fine and just let it slow cook overnight instead turned out great and kitchen smells amazing Anyone have any tips for instant pot? Hey Sandra – sometimes it depends on how everything is all layered in. If you gave it a stir before cooking or didn’t put the olive oil on the bottom it can result in a burn message. Glad it turned out well in the slow cooker! Made this for tonight — it is very good!! Thanks for the recipe! This was really yummy. I quadrupled all the spices and added a few shakes of cayenne and turmeric. I used a can of tomato sauce instead of crushed tomatoes, 1/2 cup of peanut butter, and the juice of one lime. With these additions it was great. Yes, the potatoes fall apart, but if they didn’t, you wouldn’t get as thick of a stew. Could you please tell me what the Instant Pot cooking directions would be if I wanted to add chicken to the recipe? Hey Leah – directions should be the same if you add in two medium-sized chicken breasts that have been cut into 1-inch pieces.